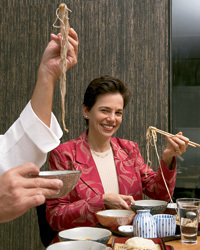 F&W’s editor, Dana Cowin, sets out to understand Japanese food traditions—but is soon impressed by how modern and trendsetting the cuisine really is. My next assignment was soba, the humble Japanese noodle. 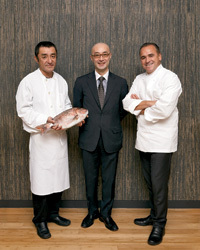 To guide me I enlisted Tadashi Ono, the chef at Matsuri and the co-author, with Harris Salat, of Japanese Hot Pots. We met at Soba-ya, one of the city’s best inexpensive soba restaurants. The jam of Japanese students confirmed its authenticity, though the laminated photo charts and generic blond-wood tables didn’t do much for me. I had what everyone else in the restaurant seemed to be having, the soba soup topped with shrimp tempura. I closed my eyes and pulled the noodles out of the broth, trying with each slurpy strand to appreciate the flavor of the buckwheat, since I was told that tasting the ingredient is what defines the perfect soba. I grasped its nutty earthiness, but I didn’t quite get what the fuss was about. I pursued further study at Matsugen with superchef Jean-Georges Vongerichten, an F&W contributing editor who owns the restaurant with Takayuki and Masashi Matsushita. Jean-Georges brought me to the soba-making room to watch a young master work with three grades of buckwheat. Rin is the finest, with most of the husk ground away; seiro has a medium amount of husk; inaka has all its husk. The soba maker ground the buckwheat between two stones, kneaded and rolled it, then folded and cut it. When I had the sobas cold, side by side with three dipping sauces, I could sense their varying intensities of flavor and texture. It was as though they were talking, the rin in quiet tones, the seiro in louder ones, the inaka shouting. 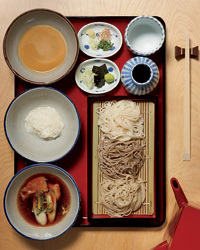 With soba, as with all Japanese food, the ingredients are revered and minimally manipulated. Today, many American restaurants follow that ingredient-centric philosophy. I thought of New York City’s Craft. When Tom Colicchio opened it in 2001, critics hailed its approach: celebrating the quality of extraordinary meat, seafood and vegetables by preparing each in the simplest, most pared-down way, then allowing diners to put together their own combinations at the table. William Grimes of the New York Times said Craft would set “next year’s trends, and perhaps the next decade’s.” And it has.